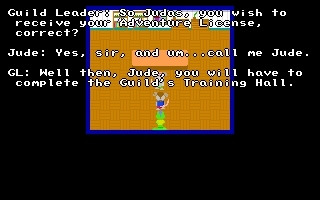 Our young rodent protagonist, Jude, wakes up one morning, late, and is reminded that he must go the the Guilds to recieve his "Adventure License" after a simple exam. Will this be a start of the greatest adventure of Jude's life? Will this lead to a great disaster? Apparently, it doesn't tell us. There is't really much to say about this game as of yet, since the demo is REALLY short, and it doesn't reveal much of the story. The only thing you can actually do, is explore around the village, then adventure through the "tedious" exam dungeon. It wasn't even a dungeon! The author called it "a tedious newbie dungeon", and it sure was! You run into a battle every two steps in that dungeon, and the emenies are absolutely ridiculous! They take off nothing, and take forever to kill. But it wasn't that bad. I took my mouse and put it on the space bar, left, then came back in 5 minutes, then I won! 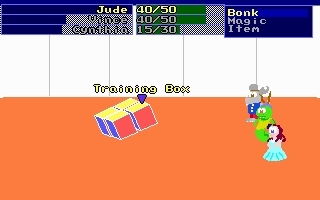 The graphics are neutral at this point (except for the cutscens, which were very well drawn). Everything lacked shading, and more detail! As for music, they are ok. At times, they were annoying, but I didn't really notice the music much. Needs working. The cutscenes were a plus, though. We need much, much more. A mouse going to get his liscense isn't going to cut it. Not much to do. The dungeon was boring. Too many random battles. Annoying in the exam dungeon, but the rest was fine. I say it should be worked on a LOT more before showing it to the world.